Rail riders every day are experiencing the impact of the Graphtec recorders hard at work in maintaining smooth rails, comfortable riding experiences, and safety measures to make sure trains are on time and the control signals are working properly. From measuring current levels in installing uniform rods into the rails to indoor air-conditioning maintenance and electrical control switch monitoring, Graphtec dataloggers offer powerful solution for dynamic and long-term measurement tools to ensure systems are running appropriately and reliably. Our portable data platform offers versatile and low-cost solution for vibration and strain analysis with focus on ready-to-launch test systems for long term recording requirement. Our dynamic high speed, high voltage portable recorders (GL2000 and GL980) can also monitor high voltage signals for troubleshooting problematic transients. Other application includes stray current analysis that require long-term monitoring of dynamic signals. Experience the power of the Graphtec solution at the palm of your hand. Handheld capability in expanding channel input to 200 channels along with data platform that can expand to 1150 channels. Confirm the status of equipment on the railway operation management system including signal and crossing point switches. Durability testing for multiple motors at once, collect data to PC via USB memory as well as LAN. Place the GL840 inside the rail cars and monitor the temperature/humidity levels inside the rail transit vehicles in measuring performances of the Air Conditioning systems. Mount the GL840 on a railcar to measure indoor and outdoor temperature and humidity levels for developing cost-efficient air conditioning. Rail construction companies can utilize the current data from the welding rods to measure and time how long they need to weld the rails together in order to have uniform welds. 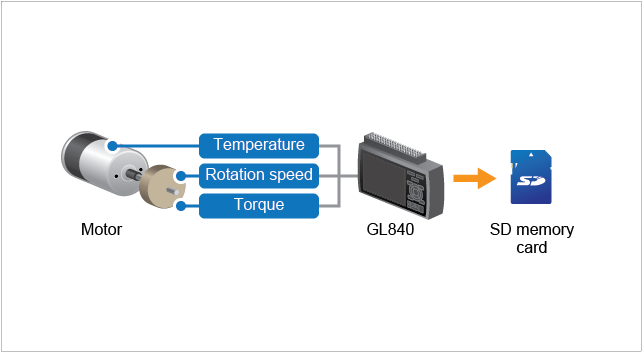 Motor durability testing can be sped up using the GL240 for 10 channel measurement for temp and RPM using the B-513 pulse cable for speed monitoring and thermocouples for temperature.